A city truck vacuums up overflowing sewage Friday as crews work on a collapsed manhole and pipe. Construction to fix the partially collapsed manhole and damaged sewer pipe may last until Wednesday or Thursday. Overflowing sewage near Santa Rita Park closed U.S. Highway 550/160 southbound midday Friday. Construction to fix the partially collapsed manhole and damaged sewer pipe may last until Wednesday or Thursday. 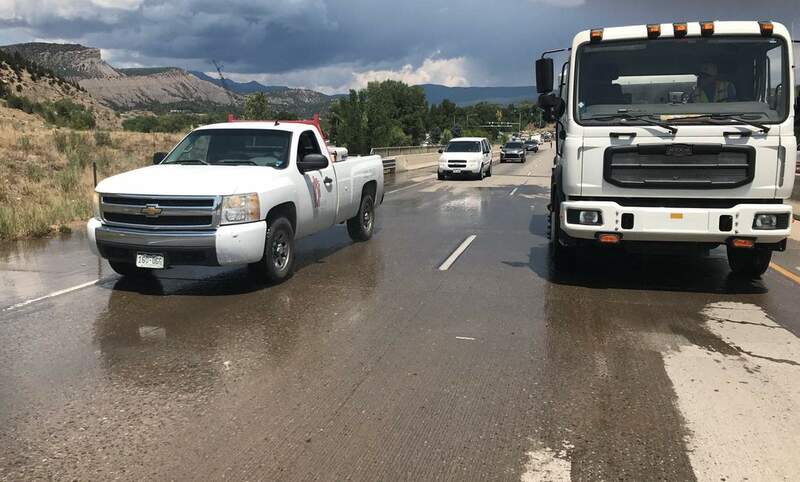 Overflowing sewage closed U.S. Highway 550/160 southbound midday Friday. Crews started to prepare for the construction to fix the problem Friday evening. Traffic control measures were expected to be in place until Wednesday or Thursday. 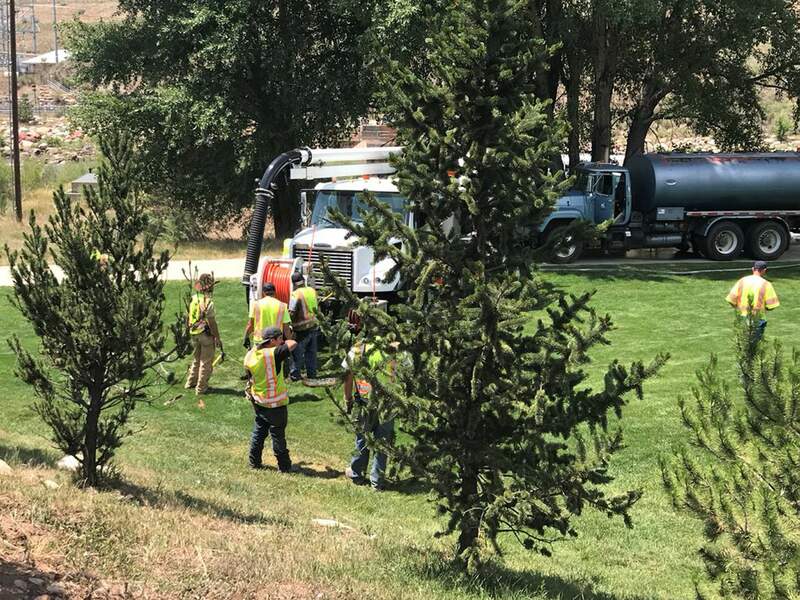 A manhole on U.S. Highway 550/160 near Santa Rita Park partially collapsed on a sewer pipe midday Friday causing sewage to spill over the highway, the Animas River Trail and some made its way to the Animas River. The necessary construction to fix the manhole and pipe is expected to cause traffic congestion on that stretch of highway until Wednesday or Thursday. Crews started to prepare for construction Friday evening, and they are expected to work through the weekend, Assistant City Manager Amber Blake said. “We are going to get to work on it as fast as possible,” she said. During construction, one lane of southbound and one lane of northbound traffic will be open from Santa Rita Park to the intersection with the frontage road and County Road 210, she said. “There will be significant impacts to traffic on U.S. 550,” Blake said. She encourages drivers to consider alternative routes, such as Colorado Highway 3 or Florida Road and County Road 234 to Elmore’s Corner. “We truly apologize for the inconvenience,” she said. The collapse was first reported about 11:30 a.m., and it caused an estimated 600 gallons to overflow from the sewer system. Fewer than 300 gallons flowed into the Animas River during a period that lasted less than two hours. It is a small amount compared with the hundreds of thousands of gallons flowing by Santa Rita Park at any given time, Blake said. The city used Vactor trucks equipped with large pumps to contain the sewage. 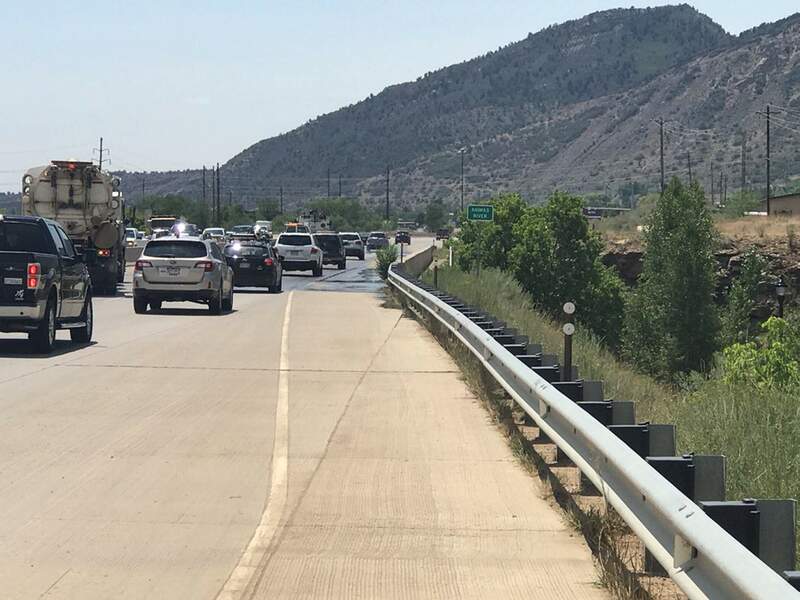 Downstream water users, including the city of Farmington, the Southern Ute Indian Tribe and the Animas-La Plata Project, were informed of the sewage spill. A bypass for sewage around the damaged area has been installed while the city repairs the manhole and the sewer pipe. The city does not know why the manhole collapsed, Blake said. In addition to the lane closures, southbound drivers on Highway 550 will be unable to turn left to access Highway 3, and Santa Rita Park will be closed to public traffic. However, construction at the wastewater treatment plan will continue, Blake said. Drivers will also be unable to access County Road 210 directly from Highway 550/160. The intersection of Sawyer Drive and Highway 550/160 will provide access to the frontage roads and businesses in Bodo Industrial Park, Lake Nighthorse and County Road 210. Crews began to establish traffic control measures late Friday. The Animas River Trail has been sanitized at the site of the sewer backup, and it is open at Santa Rita Park. Boaters can also pass through the area, but the takeout in the park will not be open. Boaters can use the Ninth Street or the Cundiff Park takeouts. As of Saturday morning, vehicle access to Santa Rita Park is restricted to construction traffic only, the city of Durango said in a new release. The city is coordinating with commercial river outfitters to take out at Cundiff Park. The decision was made Saturday morning because of safety concerns about parking large buses and trailers on the shoulder of the highway that is already experiencing traffic impacts, the news release said. There also is no pedestrian crossing at the intersection of Santa Rita Drive and Highway 550, and trail users are asked to seek alternative routes. Because of detours and traffic disruption, Durango Transit service to Walmart will be reduced to one run an hour until further notice. Anyone with questions about Durango Transit service should call 259-5438.
mshinn@durangoherald.comThis story has been updated to reflect traffic updates the city of Durango announced Saturday.